Hi, My name is Greg Lewis – sorry about the late “introduction/post” but I didn’t quite get the instructions until today – my bad! This is my 7th MET course and from what I have read and seen, it looks interesting and this motivates/energizes me which is great. 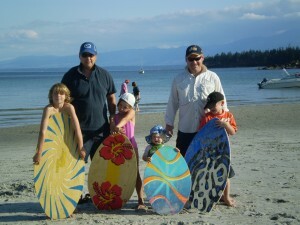 I teach at Ballenas Secondary School in Parksville on Vancouver Island, BC – home of the sandy beach and a holiday destination. I teach History 12 and am half time in the library – a wonderful assignment that I very much appreciate. The two “blondies” near myself – man in white shirt with “Vikes” hat – boo UBC! Just kidding 😉 – are Nolan (orange) and Mason(Nemo skimboard) and they keep me moving constantly! Looking forward to this course and the different focus it offers. I am on “Stalin’s Five Year Plan” and take two to three courses a year so I am getting closer.